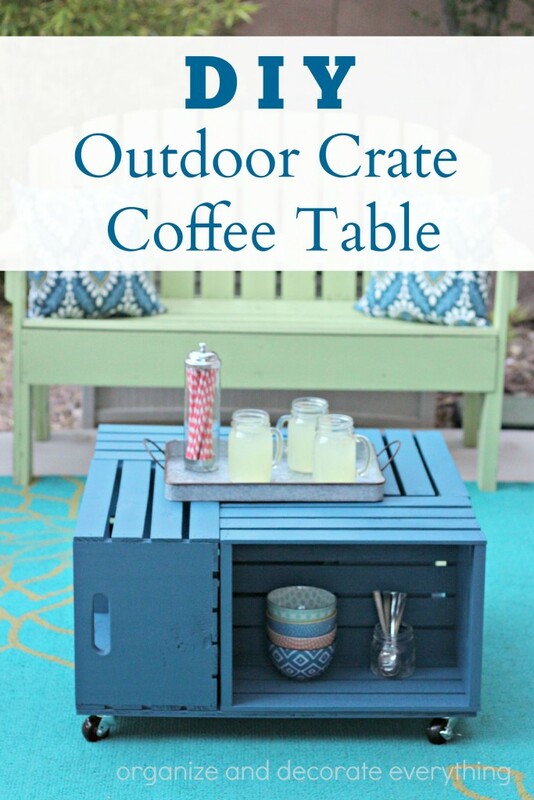 Add storage and design to your outdoor space with an easy to build DIY Outdoor Crate Coffee Table. We live in a very warm climate so we are fortunate to spend most of the year outdoors. Our back patio has become an extension of our home where we like to gather as a family. The kids read, do homework, or listen to music when they come home from school, we often eat dinner or dessert on the patio, and some evenings we just like to gather and talk as a family. I have pulled together a comfortable area with a bench, chairs, a rug, pillows, and a small table. The only thing that has been missing is a coffee table. 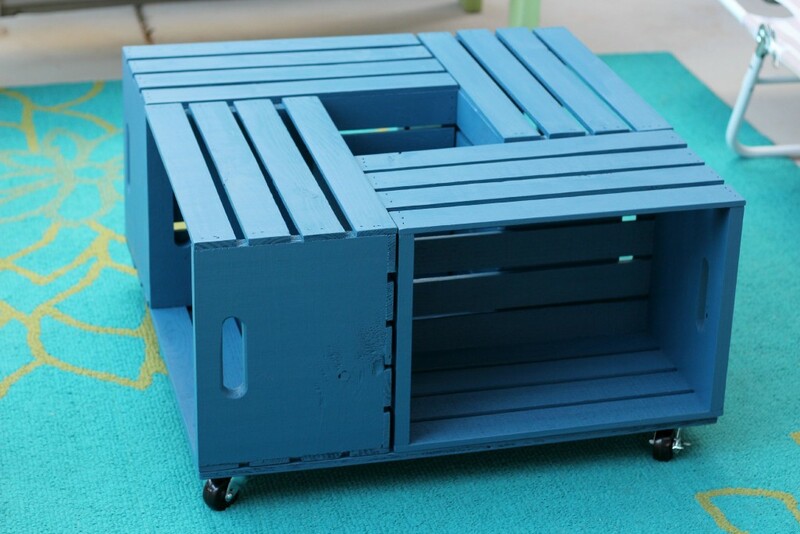 I decided I wanted a Outdoor Crate Coffee Table with plenty of space and storage. It had been on the to-do list since we moved here. I guess it was time I finally made it and quit complaining that we didn’t have enough table space. It’s hard balancing a plate full of food on your lap all the time. Choosing the paint color was the hardest part of the whole process. There is an outstanding color selection with so many beautiful options. 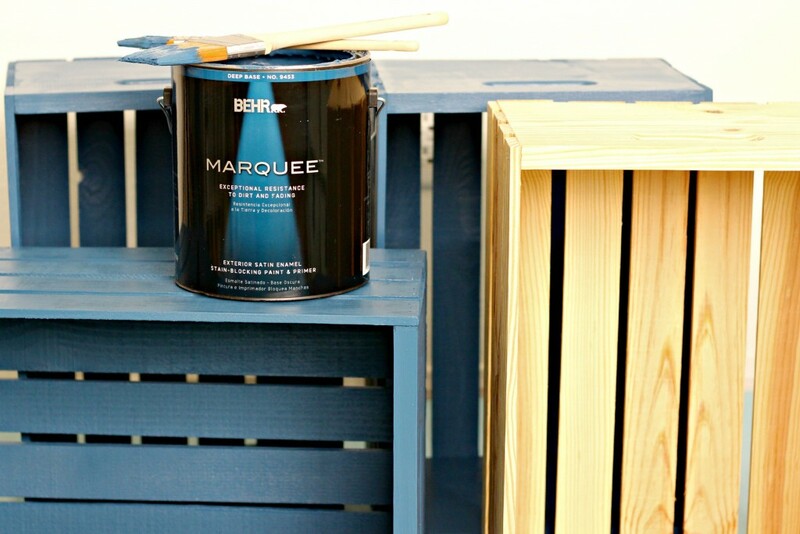 I already had a lot of summery blues and greens and decided to go with Ocean Storm by BEHR Marquee for the coffee table to make it more of a year round color. The sitting area is under a covered patio but since it is still exposed to some outdoor elements I used the BEHR Marquee exterior paint & primer. 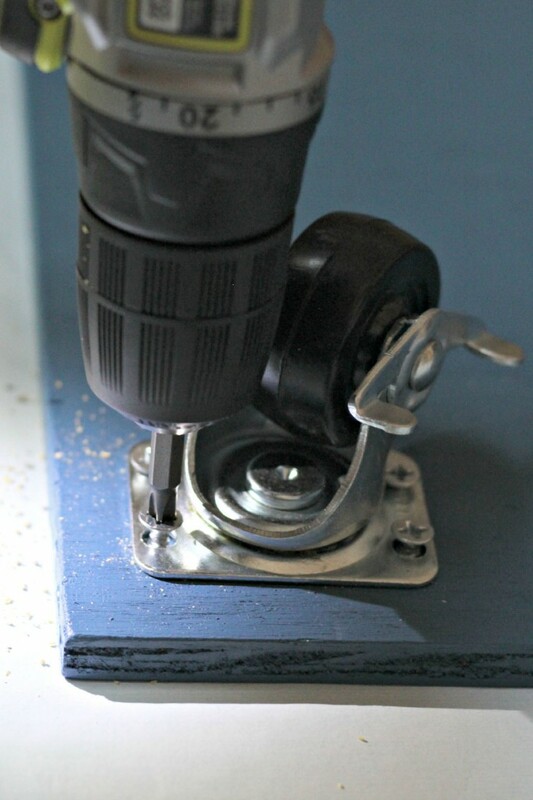 Start by lightly sanding the wood surfaces to knock off any splinters and smooth out the pieces. 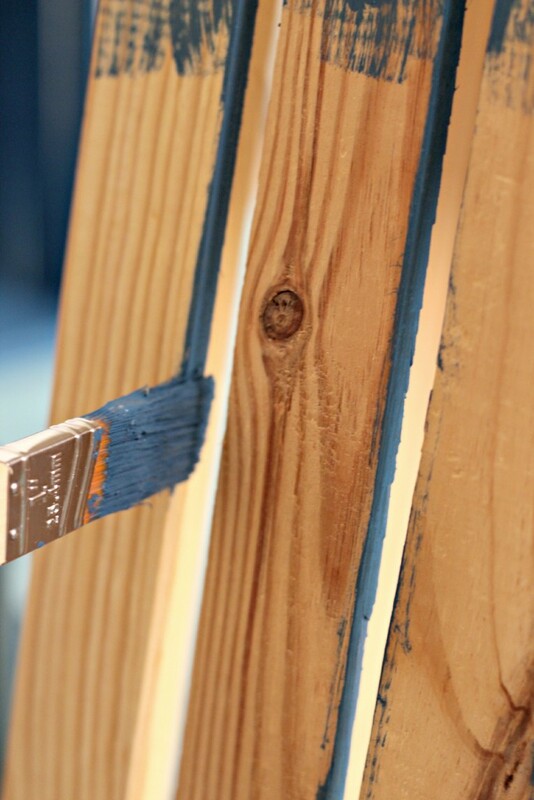 Use a damp cloth to wipe any dust off the wood pieces. Since these pieces are new and unfinished there is no need for further cleaning. Paint each piece individually before assembling. It is much easier to get the brush in all the tight spaces before it is assembled. I am pretty picky when it comes to painting so I like to make sure I take my time and apply the paint with steady, even strokes. Painting between all the slats was definitely the hardest and most time consuming part. I was so pleased with how this paint went on. I was fully prepared to add a second coat but was pleasantly surprised that I didn’t have too. 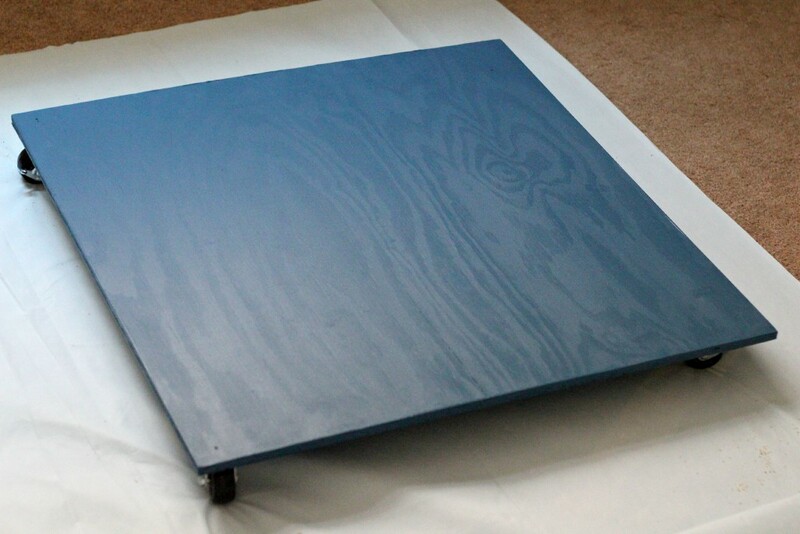 Once the paint is dry (I would wait 24 hours) screw the caster wheels into the bottom of the plywood. I marked the holes for the screws first, then drilled pilot holes to make the screws go in easier and not split the wood. 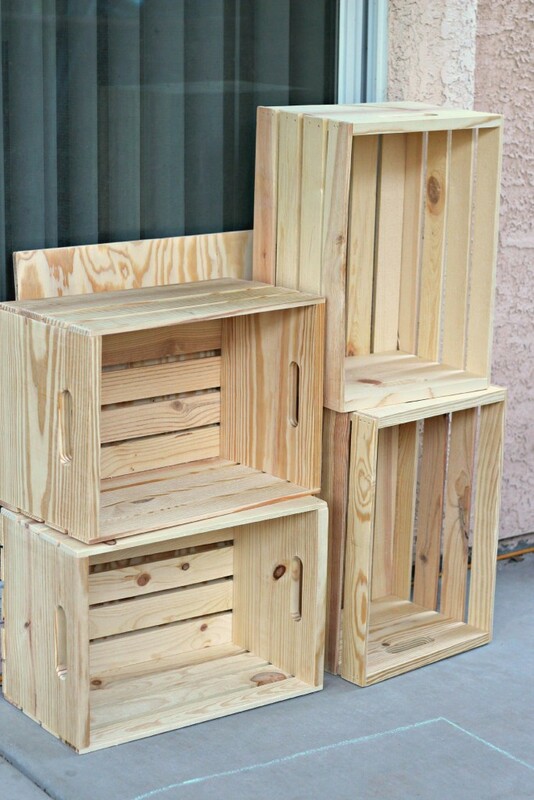 Flip the base over and place the crates on top of the plywood how you would like them. I placed the crates in the design I wanted before I had the plywood cut so I would have a good measurement. 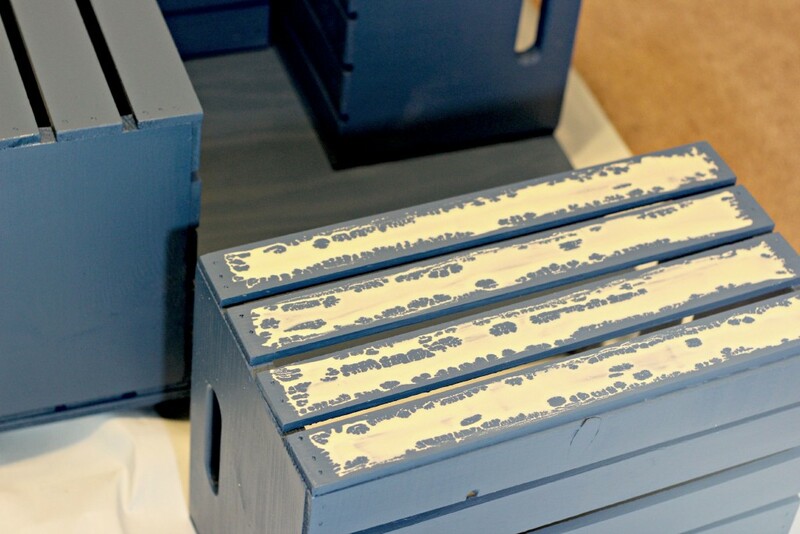 Use a generous amount of wood glue applied to the bottom slats of each crate. 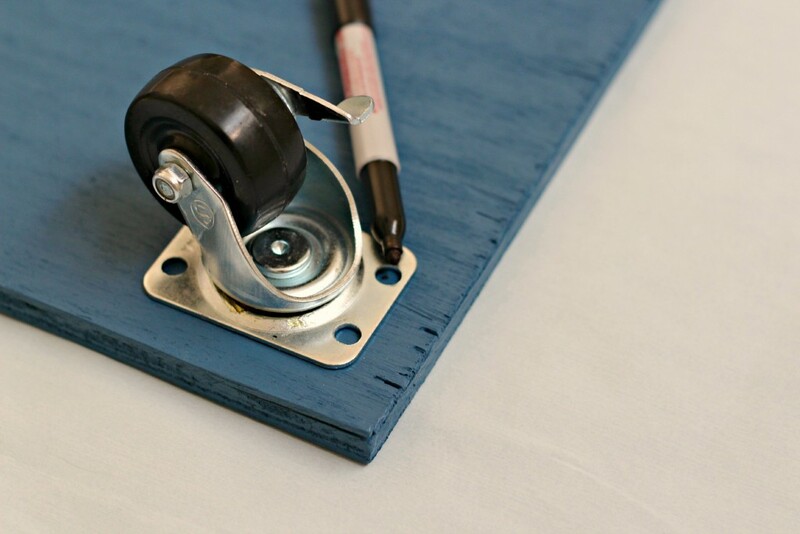 I used a foam brush to smooth the glue on the slats. Continue the process on all the crates. I sat a few heavy boxes on top of the crates until the glue was dry (wait 24 hours for the glue to be secure enough to move). I didn’t initially screw the crates onto the plywood base but since it was going to be outside I decided it would hold up in the weather better. Screw the crates to the base and then to each other to hold into place. 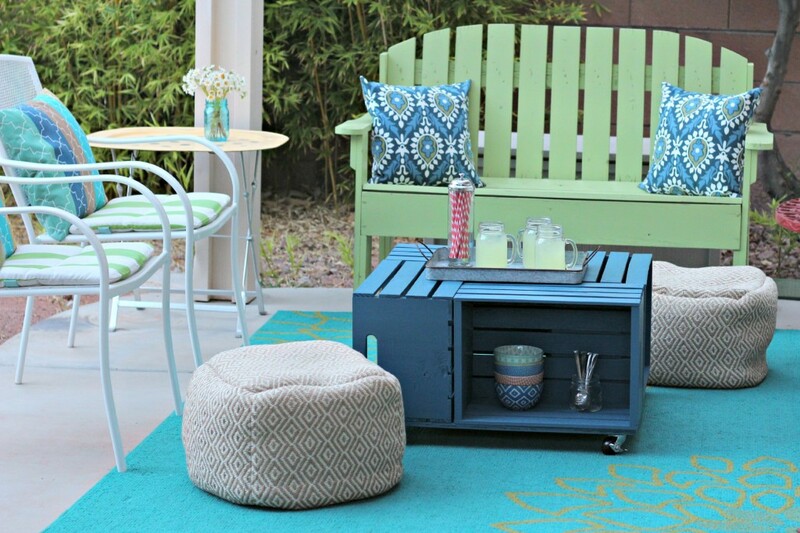 You now have an awesome outdoor coffee table with plenty of surface area and also plenty of storage space. The center area is perfect for a large plant or place a serving tray over it for more flat surface space. I feel confident leaving the table outdoors knowing the paint will hold up well. I can’t wait for even more great memories on our back patio and I’m pretty stoked that I built this table by myself. That’s a great design. I think it will look really good with a luscious plant in the center space. This looks simple. Right? Or not. 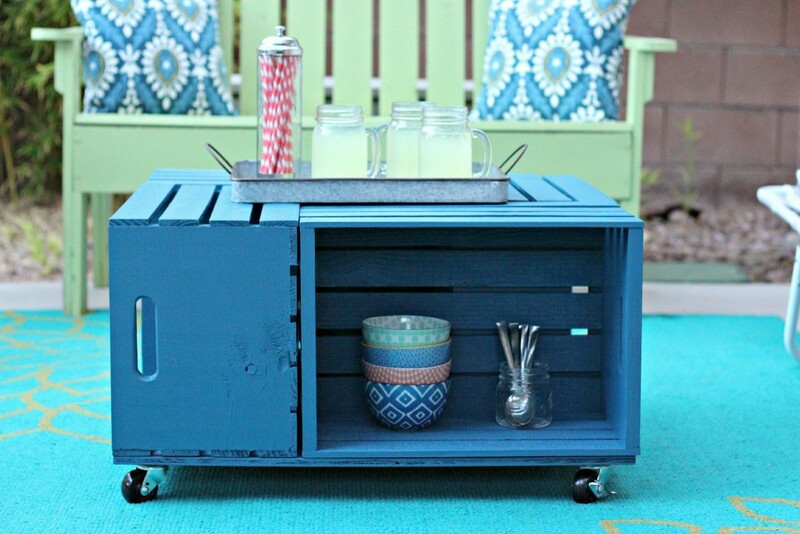 Well, I could use an outdoor crate coffee table and guess who would help get that done? Hehe, that’s right, the Mr himself. I’ll just share this page with him and subtly give a reason why I can’t participate in the making but would love it done soon. This should be fun. lol.